Vintage Mid-Century Modern slipper chair on four brass caster mounted wheels. The original red fabric is in good condition but dated. 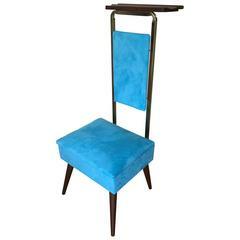 Vintage Mid-Century Modern Lucite bench or stool in newly upholstered blue fabric. Exquisite pair of Louis XVI slipper chairs, newly upholstered in pale turquoise silk moire. Single Lucite chair on casters. Great as a desk or side chair. (Please confirm item location - NY or NJ - with dealer). Jens Risom, Knoll Associates Inc.
Vintage Lucite acrylic side chair with triangle base frame and slightly curved back. Upholstered seat and chrome button fittings on joints. Perfect for a desk or vanity setting. Vintage armless slipper lounge chair in walnut, circa 1960s. This accent piece is newly reupholstered in a seafoam green tweed fabric with brand new cushions.